When FIFA president Sepp Blatter is not fire-fighting the latest corruption scandal at the top of world football, he is busy drawing up lists of everyone he would like to attend the World Cup Final as his guest. 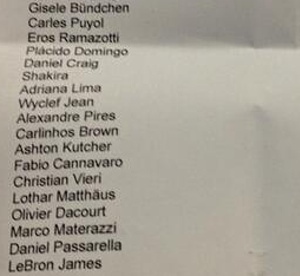 Amongst past football superstars and politicians, James Bond star Daniel Craig was on the 'to get' Very Very Important People (VVIP) list for the final in Rio this weekend. He was sandwiched between an eclectic list that also included Shakira, Gisele BÃ¼ndchen, LeBron James and Ashton Kutcher. Update: 007 was too busy to attend.